Urartu (/ʊˈrɑːrtuː/), which corresponds to the biblical mountains of Ararat, is the name of a geographical region commonly used as the exonym for the Iron Age kingdom also known by the modern rendition of its endonym, the Kingdom of Van, centered around Lake Van in the historic Armenian Highlands (present-day eastern Anatolia). The name Urartu (Armenian: Ուրարտու; Assyrian: māt Urarṭu; Babylonian: Urashtu; Hebrew: אֲרָרָט Ararat) comes from Assyrian sources. Shalmaneser I (1263–1234 BC) recorded a campaign in which he subdued the entire territory of "Uruatri". The Shalmaneser text uses the name Urartu to refer to a geographical region, not a kingdom, and names eight "lands" contained within Urartu (which at the time of the campaign were still disunited). "Urartu" is cognate with the Biblical "Ararat", Akkadian "Urashtu", and Armenian "Ayrarat". In addition to referring to the famous Biblical highlands, Ararat also appears as the name of a kingdom in Jeremiah 51:27, mentioned together with Minni and Ashkenaz. Mount Ararat is located approximately 120 kilometres (75 mi) north of its former capital. The name Kingdom of Van (Urartian: Biai, Biainili; Վանի թագավորություն), is derived from the Urartian toponym Biainili (or Biaineli), which was adopted in Old Armenian as Van (Վան), because of betacism (in linguistics, when the letters b and v undergo a sound change), hence the names "Kingdom of Van" or "Vannic Kingdom". Other Urartian toponyms and words went through the same sound change as the Armenian language spread throughout the region and absorbed them (see Erebuni and Erevan). In the 6th century BC, with the emergence of Armenia in the region, the name of the region was simultaneously referred to as variations of Armenia and Urartu. In the trilingual Behistun Inscription, carved in 521 or 520 BC by the order of Darius I, the country referred to as Urartu in Akkadian is called Arminiya in Old Persian and Harminuia in the Elamite language. The name Ayrarat that was later used to describe lands located in the central region of the Kingdom of Armenia seems to have been of local usage as no known classical works use this word to refer to Armenia. The Ararat Province of modern Armenia is named after Mount Ararat, which itself receives its name from the biblical Mountains of Ararat (or Mountains of Urartu). Shupria (Akkadian: Armani-Subartu from the 3rd millennium BC) is believed to have originally been a Hurrian or Mitanni state that was subsequently annexed into the Urartian confederation. Shupria is often mentioned in conjunction with a district in the area called Arme (also referred to as Urme or Armani) which some scholars have linked to the name of Armenia. Linguists John Greppin and Igor M. Diakonoff argued that the Urartians referred to themselves as Shurele (sometimes transliterated as Shurili or Šurili, possibly pronounced as Suri), a name mentioned within the royal titles of the kings of Urartu (e.g. "the king of Šuri-lands”). The word Šuri has been variously theorized as originally referring to chariots, swords, the region of Shupria (perhaps an attempt by the ruling dynasty to associate themselves with the Hurrians), or the entire world. Urartologist Paul Zimansky speculated that the Urartians (or at least the ruling family) may have emigrated northwest into the Lake Van region from their religious capital Musasir (Ardini). According to Zimansky, the Urartian ruling class were few in number and governed over an ethnically, culturally, and linguistically diverse population. Zimansky went so far as to suggest that the kings of Urartu might have come from various ethnic backgrounds themselves. Fragment of a bronze helmet from Argishti I's era. The "tree of life", popular among the ancient societies, is depicted. The helmet was discovered during the excavations of the fortress Of Teyshebaini on Karmir-Blur (Red Hill). Sarduri I (c. 832–820 BC), son of either Arame or the poorly attested Lutipri, successfully resisted the Assyrian attacks from the south, led by Shalmaneser III, consolidated the military power of the state, and moved the capital to Tushpa (modern Van, on the shore of Lake Van). His son, Ispuini (c. 820–800 BC) annexed the neighbouring state of Musasir, which became an important religious center of the Urartian Kingdom, and introduced the cult of Ḫaldi. Ispuini was also the first Urartian king to write in the Urartian language (previous kings left records written in Akkadian). He made his son Sarduri II viceroy. After conquering Musasir, Ispuini was in turn attacked by Shamshi-Adad V. His co-regent and subsequent successor, Menua (c. 800–785 BC) also enlarged the kingdom greatly and left inscriptions over a wide area. During Ispuini's and Menua's joint rule, they shifted from referring to their territory as Nairi, instead opting for Bianili. Urartu reached the highest point of its military might under Menua's son Argishti I (c. 785–760 BC), becoming one of the most powerful kingdoms of ancient Near East. Argishti I added more territories along the Araks River and Lake Sevan, and frustrated Shalmaneser IV's campaigns against him. Argishti also founded several new cities, most notably Erebuni Fortress in 782 BC. 6,600 captured slaves worked on the construction of the new city. Niche and base for a destroyed Urartian stele, Van citadel, 1973. Urartian stone arch near Van, 1973. According to Urartian epigraphy, Sarduri III was followed by three kings—Erimena (635–620 BC), his son Rusa III (620–609 BC), and the latter's son Rusa IV (609–590 or 585 BC). Late during the 7th century BC (during or after Sarduri III's reign), Urartu was invaded by Scythians and their allies—the Medes. In 612 BC, the Median king Cyaxares the Great together with Nabopolassar of Babylon and the Scythians conquered Assyria after it had been badly weakened by civil war. The Medes then took over the Urartian capital of Van towards 585 BC, effectively ending the sovereignty of Urartu. 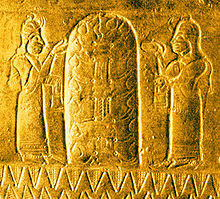 According to the Armenian tradition, the Medes helped the Armenians establish the Orontid (Yervanduni) dynasty. Many Urartian ruins of the period show evidence of destruction by fire. This would indicate two scenarios—either Media subsequently conquered Urartu, bringing about its subsequent demise, or Urartu maintained its independence and power, going through a mere dynastic change, as a local Armenian dynasty or dynasties (the Haykazunis and/or the Orontids) overthrew the ruling family with the help of the Median army. Ancient sources support the latter version: Xenophon, for example, states that Armenia, ruled by an Orontid king, was not conquered until the reign of Median king Astyages (585–550 BC) – long after Median invasion of the late 7th century BC. Similarly, Strabo (1st century BC – 1st century AD) wrote that "[i]n ancient times Greater Armenia ruled the whole of Asia, after it broke up the empire of the Syrians, but later, in the time of Astyages, it was deprived of that great authority ..."
Medieval Armenian chronicles corroborate the Greek and Hebrew sources. In particular, Movses Khorenatsi writes that the Armenian king Skayordi Haykazuni was a political foe of Assyria during the reign of Sennacherib (705-681 BCE), which would have been contemporaneous with the rule of Argishti II. Skayordi's son, Paruyr Haykazuni (also known as Paruyr Skayordi), helped Cyaxares and his allies conquer Assyria, for which Cyaxares recognized him as the king of Armenia. According to Khorenatsi, Media conquered Armenia only much later—under Astyages. It is possible that the last Urartian king, Rusa IV, had connections to the future incoming Armenian Orontids dynasty. Urartian tomb complex, Van citadel, 1973. The region formerly known as Urartu became the Satrapy of Armenia under the Persian Achaemenids and governed by the Armenian Orontid dynasty. The Satrapy later became the independent Kingdom of Armenia, under Orontid rule. Little is known of what happened to the region of Urartu under the foreign rule following its fall and the emergence of the Satrapy of Armenia. According to historian Touraj Daryaee, during the Armenian rebellion against the Persian king Darius I in 521 BC (70 years after the fall of Urartu), some of the personal and topographic names attested in connection with Armenia or Armenians were of Urartian origin, suggesting that Urartian elements persisted within Armenia after its fall. The Behistun Inscription, which was written in three languages, refers to the country as Armenia (Armina) and the people as Armenian (Arminiya) in Old Persian, but as Urartu (Urashtu) and Urartian (Urashtaa) in Akkadian, suggesting that Urartu and Armenia were part of the same geopolitical entity. With the region reunified again under Armenia, the disparate peoples of the region mixed and became more homogenous and a unified sense of identity developed, and the Armenian language became the predominant language. Some Urartians might have kept their former identity. According to Herodotus, the Alarodians (Alarodioi)—presumably a variation of the name Urartian/Araratian—were part of the 18th Satrapy of the Achaemenid Empire and formed a special contingent in the grand army of Xerxes I. According to this theory, the Urartians who of the 18th Satrapy were subsequently absorbed into the Armenian nation. Modern historians, however, have cast doubt on the Alarodian connection to the Urartians as the latter are never recorded as having applied an endonym related to "Ararat" to themselves. As the Armenian identity developed in the region, the memory of Urartu faded and disappeared. Parts of its history passed down as popular stories and were preserved in Armenia, as written by Movses Khorenatsi in the form of garbled legends in his 5th century book History of Armenia, where he speaks of a first Armenian Kingdom in Van which fought wars against the Assyrians. It is worth noting that no kingdom called "Armenia" existed during the time that Assyria did, but Urartu (Van) did. Khorenatsi's stories of these wars with Assyria would help in the rediscovery of Urartu. Urartu comprised an area of approximately 200,000 square miles (520,000 km2), extending from the Euphrates in the West to Lake Urmia in the East and from the Caucasus Mountains south towards the Zagros Mountains in northern Iraq. It was centered around Lake Van, which is located in present-day eastern Anatolia. At its apogee, Urartu stretched from the borders of northern Mesopotamia to the southern Caucasus, including present-day Turkey, Nakhchivan, Armenia and southern Georgia (up to the river Kura). Archaeological sites within its boundaries include Altintepe, Toprakkale, Patnos and Haykaberd. Urartu fortresses included Erebuni Fortress (present-day Yerevan), Van Fortress, Argishtihinili, Anzaf, Haykaberd, and Başkale, as well as Teishebaini (Karmir Blur, Red Mound) and others. Head of a Bull, Urartu, 8th century BC. This head was attached to the rim of an enormous cauldron similar to the one shown above. Walters Art Museum collections. On 12 November 2017, it was announced that archaeologists in Turkey's eastern Van Province had discovered the ruins of a 3,000-year-old Urartu castle during underwater excavations around Lake Van led by Van Yüzüncü Yıl University and the Governorship of Turkey's eastern Bitlis Province, and that revealed these underwater ruins are from the Iron Age Urartu civilization and are thought to date back to the eighth to seventh centuries BC. While the Urartians incorporated many deities into their pantheon, they appeared to be selective in their choices. Although many Urartian kings made conquests in the North, such as the Lake Sevan region, many of those peoples' gods remain excluded. This was most likely the case because Urartians considered the people in the north to be barbaric, and disliked their deities as much as they did them. Good examples of incorporated deities however are the goddesses Bagvarti (Bagmashtu) and Selardi, both potentially of Armenian origins. On Mheri-Dur (Meher-Tur) (the "Gate of Mehr"), overlooking modern Van, an inscription lists a total of 79 deities, and what type of sacrificial offerings should be made to each; goats, sheep, cattle, and other animals served as the sacrificial offerings. Urartians did not practice human sacrifice. The pantheon was headed by a triad made up of Ḫaldi (the supreme god), Theispas (Teisheba, god of thunder and storms, as well as sometimes war), and Shivini (a solar god). Their king was also the chief-priest or envoy of Ḫaldi. Some temples to Ḫaldi were part of the royal palace complex, while others were independent structures. Ḫaldi was not a native Urartian god but apparently an obscure Akkadian deity (which explains the location of the main temple of worship for Ḫaldi in Musasir, believed to be near modern Rawandiz, Iraq). Ḫaldi was not initially worshipped by Urartians, at least as their chief god, as his cult does not appear to have been introduced until the reign of Ishpuini. Theispas was a version of the Hurrian god, Teshub. According to Diakonoff and Vyacheslav Ivanov, Shivini (likely pronounced Shiwini or Siwini) was likely borrowed from the Hittites. The earliest dialect of Hurrian, seen in the Tiš-atal royal inscription and reconstructed from various early second millennium B.C.E. sources, shows features that disappeared in later Hurrian but are present in Urartian (Wilhelm 1988:63). In short, the more we discover or deduce about the earliest stages of Hurrian, the more it looks like Urartian (Gragg 1995:2170). The Urartian language is an ergative-agglutinative language, which belongs to neither the Semitic nor the Indo-European language families, but to the Hurro-Urartian language family, which is possibly related to North-East Caucasian languages. Many scholars, however, doubt that the language families are related, or believe that, while a connection is possible, the evidence is far from conclusive. Urartian cuneiform recording the foundation of Erebuni Fortress by Argishti. Far from being grounded on long standing cultural uniformities, [Urartu] was merely a superstructure of authority, below which there was plenty of room for the groups to manifest in the Anatolia of Xenophon to flourish. We need not hypothesize massive influxes of new peoples, ethnic replacement, or any very great mechanisms of cultural change. The Armenians, Carduchoi, Chaldaioi, and Taochoi could easily have been there all along, accommodated and concealed within the structure of command established by the Urartian kings. Ultimately, little is known of what was truly spoken in the geopolitical region until the creation of the Armenian alphabet in the 4th century AD. Some scholars believe that the ethnonym "Armina" itself and all other names attested with reference to the rebellions against Darius in the Satrapy of Armenia (the proper names Araxa, Haldita, and Dādṛšiš, the toponyms Zūzahya, Tigra, and Uyamā, and the district name Autiyāra) are not connected with Armenian linguistic and onomastic material attested later in native Armenian sources, nor are they Iranian, but seem related to Urartian. However, others suggest that some of these names have Armenian or Iranian etymologies. The presence of a population who spoke proto-Armenian in Urartu prior to its demise is subject to speculation, but the existence of Urartian words in the Armenian language suggests early contact between the two languages and long periods of bilingualism. It is generally assumed that proto-Armenian speakers entered Anatolia around 1200 BC, during the Bronze Age Collapse, which was three to four centuries before the emergence of the Kingdom of Urartu. The presence of Armenian speakers in the Armenian Highlands prior to the formation of the Kingdom of Urartu is supported by a reference to "the king of Uiram" in an 11th-century BCE list of lands conquered by the Assyrian king Tiglath-Pileser I. The Armenians according to Diakonoff, are then an amalgam of the Hurrian (and Urartians), Luvians [Luwians] and the Proto-Armenian Mushki who carried their IE [Indo-European] language eastwards across Anatolia. After arriving in its historical territory, Proto-Armenian would appear to have undergone massive influence by the languages it eventually replaced. Armenian phonology, for instance, appears to have been greatly affected by Urartian, which may suggest a long period of bilingualism. However, this theory is somewhat problematic as the Assyrians referenced the Armenians and the Mushki as separate groups, and the Armenians never identified themselves as Mushki (although the -k in Mushk(i) is believed to be an Armenian plural marker, which suggests Armenians were aware of the Mushki). Additionally, some modern studies show that assertions about the proximity of the Greek and Phrygian (Mushki) languages with Armenian are not confirmed in the language material and that Armenian is as close to Indo-Iranian as it is to Greek and Phrygian. An alternate theory suggests that Armenians were tribes indigenous to the northern shores of Lake Van or Urartu's northern periphery (possibly as the Hayasans, Etuini, and/or Diauehi, all of whom are known only from references left by neighboring peoples such Hittites, Urartians and Assyrians). While the Urartian language was used by the royal elite, the population they ruled may have been multi-lingual, and some of these peoples would have spoken Armenian. The Urartian confederation united the disparate peoples of the highlands, which began a process of intermingling of the peoples and cultures (including possibly Armenian tribes) and languages (potentially including proto-Armenian) within the highlands. This intermixing would ultimately culminate in the emergence of the Armenians as the dominant polity and culture of the Armenian Highlands, and as the direct successors and inheritors of the Urartian domain. A complimentary theory, suggested by Tamaz V. Gamkrelidze and Ivanov in 1984, places the Proto-Indo-European homeland (the location where Indo-European would have emerged from) in the Armenian Highlands (see: Armenian hypothesis), which would entail the presence of proto-Armenians in the area during the entire lifetime of the Urartian state. The Armenian hypothesis supports the theory that the Urartian language was not spoken, but simply written, and postulates that the Armenian language as an in situ development of a 3rd millennium BC Proto-Indo-European language. ^ Paul Zimansky, "Urartian material culture as state assemblage", Bulletin of the American Association of Oriental Research 299 (1995), 105. ^ a b Diakonoff, Igor M (1992). "First Evidence of the Proto-Armenian Language in Eastern Anatolia". Annual of Armenian Linguistics. 13: 51–54. ISSN 0271-9800. ^ Róna-Tas, András.Hungarians and Europe in the Early Middle Ages: An Introduction to Early Hungarian History. Budapest: Central European University Press, 1999 p. 76 ISBN 963-9116-48-3. ^ Greppin, John A. C. (1991). "Some Effects of the Hurro-Urartian People and Their Languages upon the Earliest Armenians". Journal of the American Oriental Society. 3 (4): 720–730. doi:10.2307/603403. JSTOR 603403. Even for now, however, it seems difficult to deny that the Armenians had contact, at an early date, with a Hurro-Urartian people. ^ a b c d Chahin, M. (2001). The kingdom of Armenia: a history (2nd revised ed.). Richmond: Curzon. p. 182. ISBN 978-0700714520. ^ Jacobson, Esther (1995). The Art of the Scythians: The Interpenetration of Cultures at the Edge of the Hellenic World. BRILL. p. 33. ISBN 9789004098565. ^ a b Frye, Richard N. (1984). The History of Ancient Iran. Munich: C.H. Beck. p. 73. ISBN 978-3406093975. The real heirs of the Urartians, however, were neither the Scythians nor Medes but the Armenians. ^ Redgate, A. E. (2000). The Armenians. Oxford: Blackwell. p. 5. ISBN 978-0631220374. However, the most easily identifiable ancestors of the later Armenian nation are the Urartians. ^ a b Lang, David Marshall (1980). Armenia: Cradle of Civilization (3rd ed.). London: Allen & Unwin. pp. 85–111. ISBN 978-0049560093. ^ Eberhard Schrader, The Cuneiform inscriptions and the Old Testament (1885), p. 65. ^ Abram Rigg Jr., Horace. "A Note on the Names Armânum and Urartu". Journal of the American Oriental Society, 57/4 (Dec., 1937), pp. 416–418. ^ Zimansky, Paul E. Ancient Ararat: A Handbook of Urartian Studies. Delmar, NY: Caravan Books, 1998, p. 28. ISBN 0-88206-091-0. ^ a b Lang, David Marshall. Armenia: Cradle of Civilization. London: Allen and Unwin, 1970, p. 114. ISBN 0-04-956007-7. ^ a b Redgate, Anna Elizabeth. The Armenians. Cornwall: Blackwell, 1998, pp. 16–19, 23, 25, 26 (map), 30–32, 38, 43 ISBN 0-631-22037-2. ^ A. Y. Movsisyan, "The hieroglyphic script of van kingdom (Biainili, Urartu, Ararat)", Publishing House Gitutyun of NAS RA, Yerevan 1998. ^ I. M. Diakonoff, "Hurro-Urartian Borrowings in Old Armenian". Journal of the American Oriental Society, 105/4 (October–December 1985), p. 601. ^ Brand, Chad; Mitchell, Eric; Staff, Holman Reference Editorial (November 2015). Holman Illustrated Bible Dictionary. B&H Publishing Group. ISBN 978-0-8054-9935-3. ^ Freedman, David Noel; Myers, Allen C. (2000-12-31). Eerdmans Dictionary of the Bible. Amsterdam University Press. ISBN 978-90-5356-503-2. ^ a b Hewsen, R. H. "AYRARAT". Encyclopædia Iranica. Retrieved 2012-09-03. ^ Lehmann-Haupt, C. F. Armenien. Berlin: B. Behr, 1910–1931. ^ Piotrovsky, Boris B. The Ancient Civilization of Urartu. New York: Cowles Book Co., Inc., 1969, 51. ^ a b Greppin, John A.C. and Igor Diakonoff Some Effects of the Hurro-Urartian People and Their Languages upon the Earliest Armenians, Oct-Dec 1991, pp. 727. ^ a b Zimansky, Paul Ecology and Empire: The Structure of the Urartian State, 1985, pp. 67. ^ D.D. Luckenbill, Ancient Records of Assyria and Babylonia, (1927, vol II:84), quoted in Robin Lane Fox, Travelling Heroes in the Epic Age of Homer (2008:17). ^ Letter of Ashubanipal to Sarduri III. HABL, № 1242. ^ Kurdoghlian, Mihran (1994). Badmoutioun Hayots, Volume I (in Armenian). Hradaragoutioun Azkayin Oussoumnagan Khorhourti. pp. 46–48. ^ Xenophon.Cyropedia. 3.7. Translated by Henry Graham Dakyns. ^ (in Armenian) Movses Khorenatsi. Հայոց Պատմություն, Ե Դար [History of Armenia, Fifth Century]. Annotated translation and commentary by Stepan Malkhasyants, ed. Gagik Sargsyan. Yerevan: Hayastan Publishing, 1997, I.21, pp. 100–101. ISBN 5-540-01192-9. ^ "Urartu – Lost Kingdom of Van". Archived from the original on 2015-07-02. Retrieved 2015-06-18. ^ Van de Mieroop, Marc. A History of the Ancient Near East c. 3000 – 323 BC. Cornwall: Blackwell, 2006, p. 205. ISBN 1-4051-4911-6. ^ a b Daryaee, Touraj The Fall of Urartu and the Rise of Armenia, 2018, pp. 39. ^ "ARMENIA and IRAN i. Armina, Achaemenid province". Encyclopaedia Iranica. December 15, 1986. Archived from the original on 2018-05-17. Retrieved 2018-05-22. ^ Diakonov, I. The Pre-history of the Armenian People. Delmar, NY: Caravan Books, 1984. ^ a b Zimansky, Paul "Urartian and Urartians." The Oxford Handbook of Ancient Anatolia (2011): 556. ^ Armen Asher The Peoples of Ararat. 2009, p. 291. ISBN 978-1-4392-2567-7. ^ Zimansky, Paul E. (2011-01-01). "Urartu". The Oxford Encyclopedia of Archaeology in the Near East. Oxford University Press. doi:10.1093/acref/9780195065121.001.0001. ISBN 978-0-19-506512-1. Retrieved 2018-11-22. ^ Burney, Charles (2009-01-01). "Urartu". The Oxford Companion to Architecture. Oxford University Press. doi:10.1093/acref/9780198605683.001.0001. ISBN 978-0-19-860568-3. Retrieved 2018-11-22. ^ Dan, Roberto (2014). "Inside the Empire: Some Remarks on the Urartian and Achaemenid Presence in the Autonomous Republic of Nakhchivan". Iran & the Caucasus. 18 (4): 327–344. doi:10.1163/1573384X-20140402. ISSN 1609-8498. JSTOR 43899165. ^ Lynch, H.F.B. Armenia, Travels and Studies, Volume 2. London: Longmans, 1901, p. 54. ^ "Underwater ruins of 3,000-year-old castle discovered in Turkey". Daily Sabah. Turkey. 12 November 2017. Retrieved 21 November 2017. ^ Piotrovskii, Boris, B. Ванское царство (Урарту), Moscow: Vostochnoy Literaturi Publishing, 1959. ^ Piotrovsky, Boris B. (1969). The Ancient Civilization of Urartu: An Archaeological Adventure. Cowles Book Co. ISBN 978-0-214-66793-0. ^ Chahin, Mark (1987). The Kingdom of Armenia. Dorset Press. ISBN 978-0-88029-609-0. ^ a b Zimansky, Paul (2012). Imagining Haldi. p. 714. ^ Cite error: The named reference zimansky was invoked but never defined (see the help page). ^ Vyacheslav V. Ivanov. "Comparative Notes on Hurro-Urartian, Northern Caucasian and Indo-European" (PDF). ^ Sergei A. Starostin: Igor M. Diakonoff, Hurro-Urartian as an Eastern Caucasian Language. Munich: R. Kitzinger, 1986. ^ Greppin, JAC, The Urartian Substratum in Armenian, http://www.science.org.ge/2-2/Grepin.pdf[permanent dead link], 2008. ^ Zimansky, Paul "Urartian and Urartians." The Oxford Handbook of Ancient Anatolia (2011): 556. ^ Sayce, Archibald H. "The Kingdom of Van (Urartu)" in Cambridge Ancient History. Cambridge: Cambridge University Press, 1982, vol. 3, p. 172. See also C. F. Lehman-Haupt, Armenien Einst und Jetzt, Berlin, 1931, vol. 2, p. 497. ^ Armen Asher The Peoples of Ararat. 2009, p. 290-291. ISBN 978-1-4392-2567-7. ^ Schmitt, R. "ARMENIA and IRAN i. Armina, Achaemenid province". Encyclopædia Iranica. Retrieved 2012-09-03. ^ "Assyrian Catalogue of Anatolian lands and leaders". ^ a b c (in Armenian) Katvalyan, M. and Karo Ghafadaryan. Ուրարտու [Urartu]. Armenian Soviet Encyclopedia. Yerevan: Armenian Academy of Sciences, 1986, vol. 12, pp. 276–283. ^ Samuelian, Thomas J. (2000). Armenian origins: an overview of ancient and modern sources and theories. Iravunq Pub. House. ^ "Armenians" in Adams, Douglas Q. (1997). Encyclopedia of Indo-European Culture. Taylor & Francis. ISBN 978-1-884964-98-5. ^ Clackson, James P.T. (2008). "Classical Armenian". The Ancient Languages of Asia Minor. New York: Cambridge University Press. p. 124. ^ Armen Petrosyan (January 1, 2007). The Problem Of Identification Of The Proto-Armenians: A Critical Review. Society For Armenian Studies. pp. 46, 49. Retrieved 23 November 2018. ^ a b Gamkrelidze, Tamaz V.; Ivanov, Vyacheslav (1995). Indo-European and the Indo-Europeans: A Reconstruction and Historical Analysis of a Proto-Language and Proto-Culture. Part I: The Text. Part II: Bibliography, Indexes. Walter de Gruyter. ISBN 978-3-11-081503-0.